Hi, my name is Mark Collard. 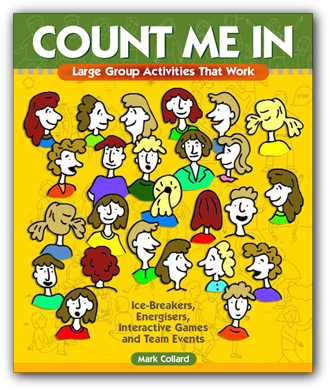 'Count Me In' features hundreds of sure-fire, high-energy, interactive, leave-them-wanting-for-more activities for BIG (and small) groups. If you regularly work with numbers in excess of 30 people - indeed, up to several hundred people - you will learn a ton of brilliant ideas that will keep them - ALL of them - occupied and interacting at the same time, and coming back for more. You'll also learn some of the most useful and practical leadership tips that will squeeze more than just fun out of your programs and make you look like an expert. people occupied, having fun and active at the same time. the world for more than 20 years. from now - simply hit the ORDER NOW link below. No book or resource is worth its price unless it gives you OUTSTANDING VALUE - which is why I offer a 100% Money-Back Guarantee. You'll either love the ideas, activities and advice in this book, or you'll get your money back - simple as that. At AUD$77 AUD$54 (which includes postage anywhere in Australia), it's worth every cent. That's less than 18 cents for every idea and activity described within its 260 fun-filled pages. A more powerful question to ask is: How much is a good idea worth to you? That's about as fair as it gets, right? But, don't just take my word for it. Take a look at the following customer testimonials, or click here for dozens more like them. That Work With LARGE Groups? © Mark Collard All rights reserved. Will Quickly & Easily "Break The Ice"
Resource Like 'Count Me In' Worth? I don't expect ... or want ... to keep your money. post and I'll happily refund your money in full. Let me tell you what I'll do to make this a FANTASTIC investment for you. I'm going to throw in three FREE BONUSES that are worth more than twice as much as my book. This bonus will give you an MASSIVE $16 discount on the purchase price of my best-selling activity publication 'No Props: Great Games with No Equipment.' It has been the top-selling adventure education title for several years, and it's yours for a CRAZY $33 - that's 2/3 the price! This bonus is so cool. At any time during the next twelve months, if you would like me to help you design a powerful, inspiring program for your group, or if you have any questions at all, all you have to do is call. My time is free to YOU, for one whole hour! I'll give you my personal phone number, or we could arrange to meet. Valued at $110, you have an hour of my time to gain as much of my expertise as you can - for FREE. This bonus is all about getting 'Count Me In' into your hands as soon as possible - and it's only available to people who order online. I've designed a special 28 page ebook (pdf doc) which features the first sections of 'Count Me In' so you can start reading my book within minutes of ordering online. In the meantime, the actual soft-cover book will be winging its way to you via the post. But, they're yours FREE if you choose to purchase 'Count Me In' right now. For a low AUD$70 AUD$54 (inc postage anywhere in Australia), you're getting hundreds of brilliant activities and ideas that are specifically designed for large (and small) groups ... PLUS, A WHOLE LOT MORE. of proven, fun activity ideas in your next program? Wishing you every program success. PS: Don't forget, you're getting AUD$126 worth of FREE bonuses, and you'll be able to start reading 'Count Me In' within 2 minutes. It will give you everything you need to help you deliver brilliant programs with groups of all sizes. Order Now! PPS: Got questions? Check out the comprehenisve FAQ page. • My SECRET WEAPON (that is just four words) for delivering a brilliant program everytime! • 'No Props' is the perfect companion to 'Count Me In' - together, you will have a veritable treasure chest of awesome programming ideas. MORE THAN 300 ice-breakers, energisers, interactive games and team events that are designed specifically to work with large groups of people (indeed, almost all of them work with small groups too). More than half of the activities require no equipment whatsoever, and appeal to people of all ages, backgrounds and abilities. Illustrations which capture the essence of every activity which will help you easily 'see' it and recreate its magic. 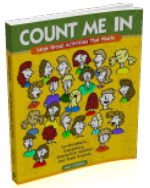 Dozens of fun, innovative ways to split your large group into smaller groups. Eleven ESSENTIAL, PRACTICAL TIPS for working effectively with large groups that will help you create a fun learning environment and foster surprising levels of participation.